Kia ora koutou katoa, and welcome to CPAG's March 2019 newsletter. CPAG has produced a series of regional profiles for Whangarei, Nelson, Christchurch and Dunedin using The New Zealand Index of Multiple Deprivation (IMD). The IMD is a set of tools for identifying and measuring deprivation at the neighbourhood-level in data zones that have been custom-designed to produce better small area information, without losing information due to confidentiality issues. In his presentations, which are being held in Nelson, Dunedin and Christchurch, Associate Professor Dan Exeter will discuss the development of the IMD, and demonstrate the different ways in which the IMD and its domains can be used to better understand the drivers of deprivation within each city's region. Dan will also discuss the potential for the IMD to inform health and social policy. 26 March | Measuring deprivation in the Nelson-Marlborough region | 5pm - 7pm at the Red Cross Rooms, 59 Parkers Road, Nelson. Download the poster here. 2 April | Measuring deprivation in the Otago region | 5:30- 7pm at Dunedin Community House, Alexander McMillan Room, 301 Moray Place Dunedin Central. Download the poster here. 3 April | Measuring deprivation in the Canterbury region | 6pm-7pm at Community Law Canterbury, 198 Montreal Street, Christchurch. Download the poster here. 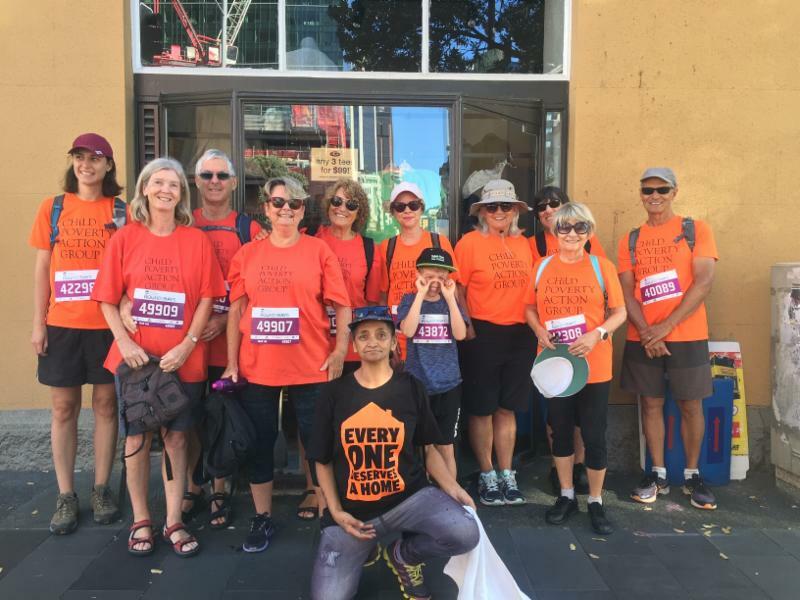 We had a record turnout of CPAG members and supporters at the iconic Auckland Round the Bays fun run on Sunday 3 March, 2019. The Ports of Auckland Round the Bays is an annual event that brings together communities from far and wide to support the wonderful work of New Zealand charities. As well as joining in with one of Auckland's foremost public events, Round the Bays offers CPAG supporters the opportunity to help fundraise for us. A big special thanks to all who came along to round the bays in Auckland in support of CPAG - they managed to raise over $1600 for our research this year. CPAG Wellington hosted a guest seminar at the University of Auckland's Wellington offices on Thursday March 7, featuring a talk from John Hancock, a senior advisor to the Human Rights Commission, on the origins of the Child Poverty Reduction Bill. John, who was central to the formation of the original Bill discussed the background to the Bill, how it works, why it should work well and to share any concerns or pitfalls to watch out for going forward. For more information download John's presentation slides here. Although home-based learning has shown to be a unique place among parents and educators, currently, home-based educators are not required to hold a relevant qualification. Concerns have arisen about what this means for the consistency of home-based educators. The Government has decided to move towards a level 4 Early Childhood Education certificate becoming the minimum qualification for home-based educators. CPAG welcomed the move, which is has been well overdue for this largely overlooked but burgeoning early childhood workforce. CPAG pokesperson Dr Jenny Ritchie says it is vital to ensure that all children in ECCE environments are accessing high quality, culturally relevant, consistent and safe educational opportunities. But quality provision can be assured only by effective resourcing, and to date the ECCE sector has suffered chronic underfunding. Read more in CPAG's press release here. CPAG welcomed the Tax Working Group's (TWG) final report which was released on February 21. An enormous amount of time, effort and expertise went into developing a comprehensive Capital Gains Tax (CGT). While CPAG recognised the importance of such an endeavour, disappointingly the opportunity was lost for exploring alternatives that could better address housing affordability and reduce inequality. CPAG suggested in a 2018 submission that the net equity approach would be much more capable of addressing inequality, and would encourage empty houses to be rented and the housing stock to be better used. CPAG commented that using the CGT revenue to increase the threshold for the 10.5% bracket is much inferior to a policy of direct redistribution. Transfers such as benefits and Working for Families tax credits are much more focused tools, and align better to the Government's aim of reducing child poverty. Read more in CPAG's press release here. On 24 February, the government released new standards which will hopefully see a move towards healthier homes in New Zealand. The standards set minimum requirements for heating, insulation, ventilation, moisture and drainage and draught stopping in residential rental properties. These regulations will become law by mid-2019 and full compliance of all rental homes can be expected by 1 July 2024. 26 February Report What makes a good life? Released by The Office of the Children's Commissioner and Oranga Tamariki. Children and young people have valuable ideas based on their everyday experiences and hopes for the future. As part of the wider public engagement for the Child and Youth Wellbeing Strategy, the Office of the Children's Commissioner and Oranga Tamariki asked children and young people for their views on what wellbeing means to them, so their voices could help inform government action on child wellbeing, as well as practitioners and communities who want to make a difference for children and young people. Over 6,000 children and young people contributed to the report, with key views including the importance of whānau, the need to be provided a basic standard of living, and the need to feel valued, accepted and respected. The WEAG reported back to the Government in February and the report is due to be released to the public in the next few weeks. The review specifically addressed 1) purpose and principles of the welfare system, 2) design and operation of the welfare system 3) how welfare interfaces with other systems, such as health, employment, housing and justice. CPAG jointly submitted to the group with ActionStation, sharing the voices of more than 200 people with first hand experience of the system. Download CPAG's recommendations for a welfare system fit for families in the 21st century here. CPAG is looking forward to seeing what the WEAG group has recommended to ensure a brighter future for all in New Zealand, and will provide a comprehensive analysis. Keep an eye out for CPAG's press release! I was relieved when I saw the words "we may be able to help with back to school costs" on the Work and Income website the other day. I clicked on it and my smile turned wry. This "help" is a loan. I meet the income test for this loan, but there is a sole parent asset limit of $1,794.51. Aside from being an enigmatically arbitrary number (that fifty one cents! ), that amount is a paltry savings buffer for a sole parent. All you need is your car to break down or emergency dental treatment, and that's it. You're down to absolutely nothing. And when you're destitute, debt is the last thing you can can afford. So, thanks but no thanks. The latest announcement from Housing Minister Phil Twyford on the new Healthy Homes standards is really great news. The new standards will mean low-income families who are renting will get homes that are able to be heated more efficiently and are better safe-guarded against dampness. Anything to stop children getting sick and being hospitalised in winter because of poor housing conditions deserves encouragement and celebration. But housing standards and the critical link between incomes and living standards are issues that aren't mutually exclusive, and they must be considered and improved in tandem. Homes are far from affordable, and electricity is expensive. Please email admin@cpag.org.nz with your details for receipting purposes. Spend My Super aims to address inequality in New Zealand by giving Kiwis the opportunity to donate their superannuation to charities like CPAG. Visit spendmysuper.org.nz to learn about how you can donate to us and support our work in 2019.